In the Spring Framework, SpringSource delivers a powerful, pragmatic, and productive approach to enterprise application development that continues to change enterprise Java for the better. We’ve taken our core values of continuous innovation and simple, powerful solutions and applied them to most aspects of enterprise applications, encompassing web, batch, integration, and more. We’ve taken those same values that helped to revolutionize the way you build applications, and applied them to how you deploy and run enterprise applications, resulting in ground-breaking products such as dm Server and tc Server. With our recent acquisition of Hyperic, we’re also transforming the way you manage enterprise applications, giving new levels of insight into applications and breaking down barriers between development and operational views of a running system. But the broader transformation in IT goes beyond Java frameworks, tooling and runtime infrastructure. The way in which people think about software stacks is changing. Virtualization is reshaping the data center, and cloud computing is set to drive far-reaching changes. Significantly, cloud computing blurs the division between development and operations, bringing new power (and responsibility) to developers. And so the question becomes, what is the most simple, powerful, pragmatic way of utilizing SpringSource technologies in the data center, and in the cloud? This is an area that we believe presents another opportunity for game-changing innovation. At the SpringOne conference earlier this year we demonstrated just a small part of our vision in this area, with direct deployment of Spring applications from the SpringSource Tool Suite to virtual machines running in a data center under the control of VMware’s Lab Manager product. The audience reaction was enthusiastic. Spring-powered applications have an application blueprint that describes how the various components fit together. With VMware’s vApp concept we can introduce a deployment blueprint that describes how the various machine images, middleware, and management components fit together – and then we can take that blueprint and “make it so” with a single click, in the data center, and in the cloud. 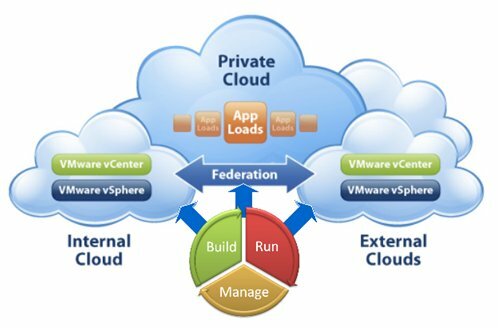 Working together with VMware we plan on creating a single, integrated, build-run-manage solution for the data center, private clouds, and public clouds. A solution that exploits knowledge of the application structure, and collaboration with middleware and management components, to ensure optimal efficiency and resiliency of the supporting virtual environment at deployment time and during runtime. A solution that will deliver a Platform as a Service (Paas) built around technologies that you already know, which can slash cost and complexity. A solution built around open, portable middleware technologies that can run on traditional Java EE application servers in a conventional data center and on Amazon EC2 and other elastic compute environments as well as on the VMware platform. VMware is a leader and innovator in a complimentary set of technologies that are central to this transformation. As the transformation progresses, the areas in which both we and VMware are strong become more and more important, as traditional anchor layers such as the operating system decline in relative importance. Both in more efficient use of existing data center resources, and as cloud computing reshapes our industry, bringing our expertise and innovation together with that of VMware can offer exciting benefits. Combined with VMware’s vSphere and other cloud-enabling technologies, we can innovate in frameworks and infrastructure to deliver a joined up experience. SpringSource application frameworks, servers and management software can give the VMware platform eyes and ears throughout the stack, allowing it to apply its uniquely advanced ability to migrate workloads and manage VMs for maximum efficiency and minimal hardware resource cost. SpringSource rapid development frameworks and tooling can provide developers with the ability to move from code to cloud in minutes. All of this with the quality you can expect from both companies, and the ease of use you can depend on from Spring technologies. SpringSource was exciting as an independent company. VMware is probably the most exciting enterprise software company today. The two together have amazing potential. SpringSource was founded by the core developers behind the Spring Framework. As we grew as a company, the success of our business allowed increased investment, and we were able to add more outstanding technologists. Today, our contribution to open source has grown to the point where we lead over a dozen Spring projects and lead or are heavily engaged in Apache Software Foundation and Eclipse projects. This commitment will continue, and we will have the ability to further increase our investment where appropriate. In the world of open source, it can never just be about us. It’s about you. Starting off as a small band of heretics who could see through the emperor’s new clothes, through becoming one of the largest mainstream communities in software (estimated by Gartner at around 2m strong), you have made it possible to realize our vision and grow our business. Thank you. I’m proud that we’ve been able to help you do your jobs. Thank you. And please continue your passionate involvement. I look forward to seeing you in New Orleans at SpringOne 2GX (October 19-22): the ultimate conference for Spring, Groovy, Grails and Tomcat. As always, we’ll be there for in-depth discussion and good fun. With Spring 3.0, STS, Spring Roo, dm Server 2.0, a new tc Server release and many other new technologies, we’ll have a lot to talk about. Sleep easy – our commitment to open source practices, licenses and traditions will remain unchanged. We expect our contributions to open source to increase. Our open source projects will retain their commitment to enabling user choice. Spring will retain the portability between deployment environments that empowers users. SpringSource has thousands of customers, including half of the G2000 companies and most of the Fortune 500. If you’re one of those customers, you will be hearing from us soon. Let me be very clear: VMware are expressing their confidence in our business as well as our technologies. There are no product overlaps between the two companies, and we do not anticipate any changes to the SpringSource product lineup beyond the exciting new releases that we are already working on. We’ll ensure that our subscription customers continue to receive high quality support experience. Our services division will continue to provide trainings world-wide on the same range of technology. Again, the SpringSource you know will continue to grow and flourish. We thought long and hard about this choice. We made the choice we did because we believe that we can achieve even more as an organization within VMware than we could on our own. Within VMware we will continue to pursue our strategy of providing a one-stop shop for the best solutions in enterprise Java, but with greater resources behind us. We’ll also get to help one of the most exciting software companies become more deeply involved in open source and middleware, and help to ensure that our technologies offer the most value as cloud computing transforms the industry. The next generation of IT requirements poses new challenges. The virtualization revolution is well under way and the power and potential of cloud computing is barely beginning to be felt. The next chapter of our work at SpringSource is tackling those challenges: Building on our Build/Run/Manage solution to provide the industry’s best solution from developer desktop to cloud deployment. Bringing Spring’s power and simplicity to enabling the millions of Java developers to benefit from the full power of cloud computing. I’m excited. And I hope you are too. This will be fun. I work with the most talented, dedicated, professional and decent group of colleagues I have ever found. There are far too many who have made valuable contributions to begin to name. Thank you. And now, let’s get back to work! You deserve to take a moment to reflect on our success over the last five years. But we only have time for a moment—we have a lot of work to do to continue our mission.